As we enter the month of December, speculation continues surrounding the end-date of the Mayan calendar on December 21, 2012. While end times prophecy is not common within our Reformed tradition, some Presbyterian preachers and authors have focused on eschatological themes at various times in the past. From the late eighteenth through the mid nineteenth centuries, several Presbyterian ministers found themselves at odds with both their presbyteries and their congregations because of their eschatological views. In the eighteenth century, the Reverend David Austin’s strongly millennial beliefs eventually resulted in his removal by the Presbytery of New York in 1797. A half century later, the Reverend John Lillie unsuccessfully defended his views before the same presbytery. Ironically his prediction about the date of the Second Advent preceded William Miller’s famous 1844 prediction by one year. By the twentieth century, Presbyterian minister and artist McKendree Robbins Long gained notoriety with both his fiery sermons that reflected a pre-millennial fundamentalist ideology and his artistic talents. 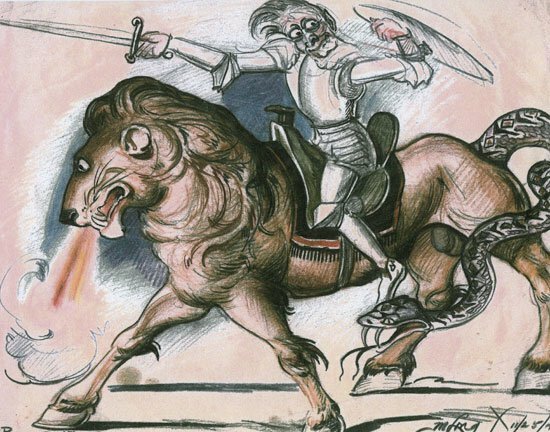 Throughout his life, Long created many Biblical drawings and paintings and toward the end of his ministry, painted a series of vivid scenes from the Book of Revelation. I find it ironic that while people the world over prepare to celebrate the birth of Jesus during this time of year, some fearfully anticipate Christ’s Second Advent rather than rejoice in the first. Consider this dialogue between two characters in a Peanuts comic strip from several years ago. One of the characters, Peppermint Patty, is in great turmoil over something she heard about the imminent end of the world. "What if the world ends tonight?" she tremblingly asks her friend Marcie. The response Marcie gives is important for placing this whole issue into a modern day context: "I promise there'll be a tomorrow,” Marcie proclaims. "In fact, it is already tomorrow in Australia." If Marcie had studied Presbyterian history and theology, she might have reminded her friend that only God knows when the world will end. And until that time, God has given us important work to do in the world. And for those still obsessed with trying to work out a timetable for Christ's return, she might have encouraged them to be prepared for the end times while not being fearfully anxious about them.